Truck caps have a long history linked to the pickup truck. 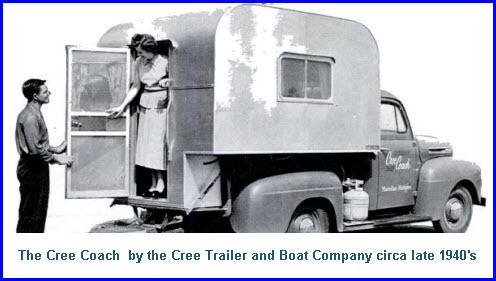 Back in the late 1940's and early 1950's the Cree Trailer and Boat Company introduced the miniature home on a pickup truck. Called the Cree Coach, it came in two models - an 8 ft. model weighing 850 lbs. and a 10ft. model with an electric refrigerator. The Cree Coach seated four people on cushioned seats and slept two when the seats were turned out. And talk about luxury, it came with a range, an oven, an icebox and a sink! Eat and Sleep. Eat and Sleep. And maybe fish or see the sights. Those were the days when a vacation was really a vacation. Of course vacations weren't free and some people actually modified these caps/campers to make sandwich trucks, pot and pan trucks and heck, maybe even Fuller Brush trucks or something like that. So from this time on the pickup truck was being used for work, play and shelter. These early truck campers were made of wooden frames with sheet aluminum covering the exterior and varnished plywood lining the interior. You were kept warm on those cold chilly nights at camp by the fiberglass insulation between interior and exterior layers and by the warm body laying next to you(or not). From this early concept evolved the construction of modern day truck caps and truck campers. Today, the most common use of the truck camper is in the form of a truck cap ( also known as truck bed cap, truck bed topper, truck canopy or camper shell ). I differentiate the truck cap from the truck camper based on use. A truck camper is used as a miniature home or as a hard shelled tent - just like the Cree Trailer and Boat Company first envisioned. A truck camper is essentially a recreational vehicle carried in the bed of a pickup truck. The truck cap is functionally used as a cover for a pickup truck bed that extends the usable space of the pickup truck bed above the bed rail and protects the space it encloses from rain, snow, etc. You can sleep under a truck cap, but it's usually in a sleeping bag. You can store your work tools in a truck camper, but you've probably got them laid across that cushy 6 ft. long bed you're gonna want to sleep on soon. Here's more info on truck campers - if you're keen to know more. Me, I'm most interested in the truck cap as I want somewhere to store tools, groceries and tall things like chairs and tables that are too high to transport using a tonneau cover. Besides, my wife thinks camping out is a 5 star hotel room with at least one bathroom and room service! Ok, so lets get on with some truck topper terms, definitions and info. I've also listed a bunch of truck bed cap manufacturers with links to a separate info page for each. MIG Welding: (Metal) (I)nert (G)as welding is a type of Gas Metal Arc Welding which is an automatable arc welding process in which a wire electrode and shielding gas are fed through a welding gun. TIG Welding: (T)ungsten (I)nert (G)as welding is an arc welding process that uses a nonconsumable tungsten electrode to produce the weld. Cab High Design: The cap/canopy/topper very closely matches the height of the pickup truck cab. High Rise Design: The cap/canopy/topper is significantly higher than the pickup truck cab and mostly level on top. It's used when increased storage capacity or space is required. Watch out for low parking garage roofs. Wedge Design: The cap/canopy/topper starts out about the same height as the pickup truck cab but then rises as it goes out towards the end of the pickup truck bed. It kinda looks like, well, a wedge! What are Truck Toppers Made of ? Fiberglass is a very popular material used in the construction of truck toppers. It's smooth and shiny, can be painted to match your pickups OEM colors and is reasonably strong and secure especially when it is laminated with the Tricel Honeycomb product used by most North American manufacturers of fiberglass tonneaus and truck caps. Many manufacturers of truck canopies also manufacture tonneau covers and other pickup truck bed accessories. I've listed the truck canopy manufacturers I am aware of below. If you know of other companies in the business, help us all out and use the Contact Us button on this page to let me know.